29 Broad Street – Charleston, SC – What a transformation! Charleston, SC has some of the most beautiful architecture everywhere you look. However, there are some buildings that are in dire need of repair – Lucky for Charleston, there is a boutique general contractor here that KNOWS exactly how to restore a building to its original glory. The Book House – Deforest Architects! I usually post a house plan on Thursday, but every once in a while I’m going to start posting stunning homes that I have run across online. I will be featuring some top notch architects/designers, so be on the lookout! Introducing, the Book House by Deforest Architects. I’m only including a few photos to taunt you, there are many on their stunning (and full of information) website! Be sure to check them out. It’s easy to get lost in their beautiful website! The Book House was a remodel project of the entire house for two avid readers and their dogs (you’ve got to see the dogs!) – I love the modern details and the steel windows and doors. Especially nice when you have a view, and do they ever! You should see the view from the bedroom! I think that the steel windows compliment this house so nicely. Yes, those “windows” are doors that open to the outside bringing the fresh air in. The back of this home is as beautiful as the front. Jaw dropping… Beautiful! Paint color for walls – Something dramatic! We love to change paint colors. It’s a problem. We probably need therapy, but it makes such a difference for a pretty insignificant amount of money. We love the all white look. LOVE IT! The creams and whites. We tried it. Painted the living room, bedroom, bathroom, and it was horrible. Capital H Horrible. The bathroom is fine, but the bedroom and living room, ugh. At first I thought I LOVED it, my eye went straight to the window and grabbed the green from the trees. Beautiful. Then we hung our art, put back our rugs and oh. Hmmm. Not so much. It didn’t flow. We have had a medium brown(Kuba by Ralph Lauren – no longer made) in a few rooms and a dark grey in the dining room. We bought a sample can of Benjamin Moore paint (I love how they do that). I painted the room I thought we would start with, the dining room. A nice, dark navy. This is the brightest time of day, it usually looks more like the left hand side versus the right hand side. I thought the brown worked so nicely with all of our paintings, but whoa, I didn’t realize how there is blue in all the paintings. Sweet! We have since decided not to start with the dining room, so the above has since been painted back to Benjamin Moore’s Kendall Charcoal. The color above is Old Navy – we may keep it or try it a bit darker (custom color, they’re so good at) – although, living with this blue, I think we want it to read blue and not black, so we may go with Old Navy… It’s good to live with it for a while – I will keep you updated! Top: Julia Nichols, Bottom two: Ken DeWaard Subject: Monhegan! Whitten Architects. When I ran across their website, all I could think about was sharing this beautiful home with you. They build new homes as well as create gorgeous renovations. This happens to be a renovation which I haven’t featured before. Just look at what they have done. 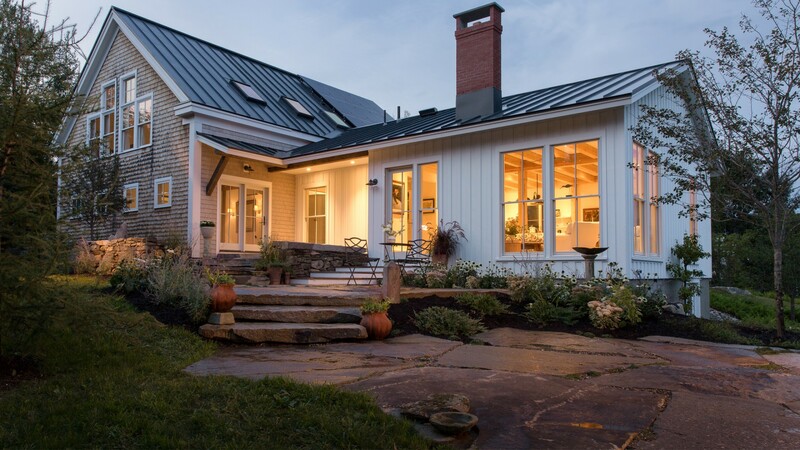 This is a stunning home in Maine called the Cortland Barn Farmhouse. 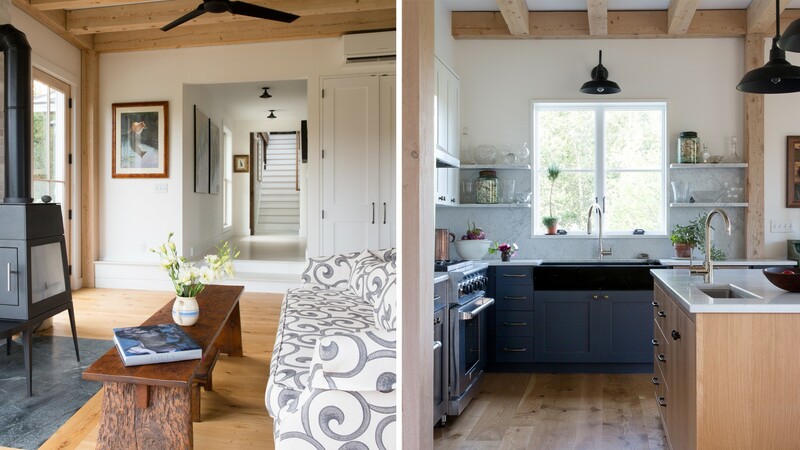 They started with a barn then added square footage creating a one of a kind home. The barn is now the garage and bedroom (in the downstairs space), and another bedroom, bathroom, sitting room and plenty of storage (in the upstairs space). Yes! Storage! 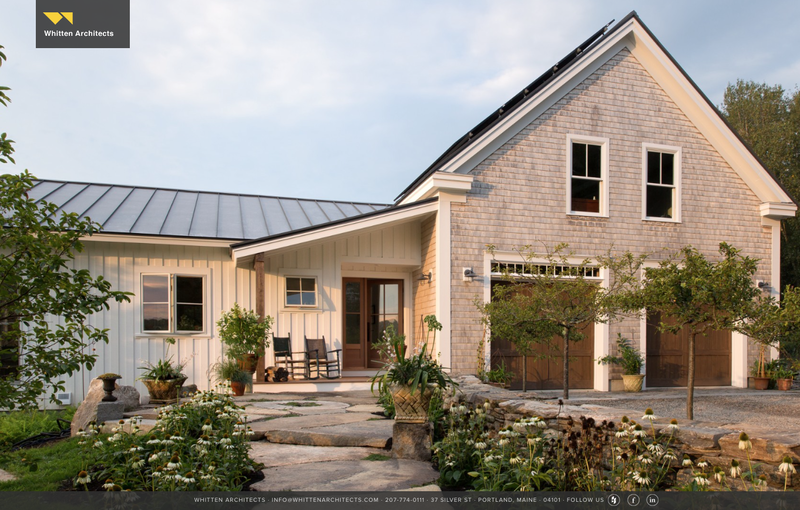 This home had 905 square feet added on to the barn and 1,458 sf of barn renovations, which brings the total square footage to 2,363. It has 3 bedrooms and 2.5 bathrooms. This home is just exactly the kind of home I would love to live in. It’s both modern and traditional at the same time. It’s clean and built smartly, keeping in mind storage and so many wonderful details. Be sure to check out the photos on their website. Read about the details of this renovation! This gives you a little glimpse into the interior, there are many wonderful photos, thanks to Jonathan Reece Photography! What a gorgeous room, and I love the glimpse to the stairway. It adds an element of design all by itself, a beautiful work of art. What you do not see are the wonderful windows in this room… I’m telling you, check out their website to see what I’m talking about! The kitchen is equally as gorgeous with plentiful cabinets, counter space and everything that makes a functional yet beautiful kitchen. This photo did me in! The back of the house is just as beautiful as the front. The bedroom windows offer light with privacy, and I love the entryway to the backyard. Every single detail was taken into consideration with this home. Bravo! 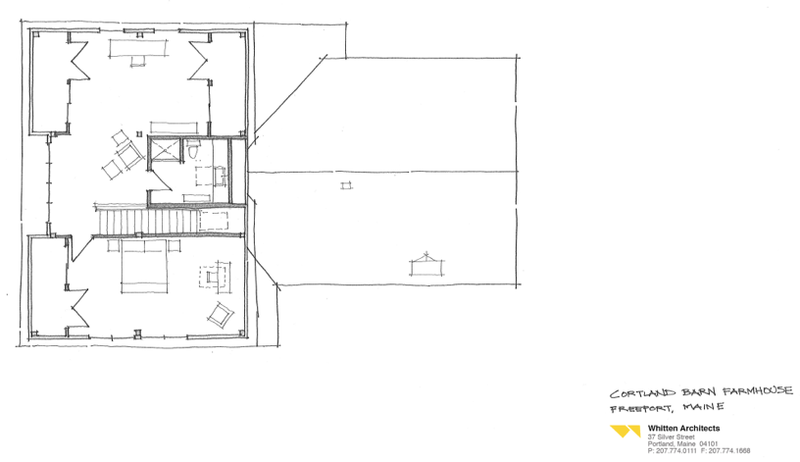 This is the layout of the home to give you an idea. On the front of the home is the garage, with the bedroom behind, that was the existing barn that was renovated. The additional added space is comfortable, beautiful, and most of all, useful! Upstairs is another bedroom which is more like a guest suite. There is also a bathroom, a sitting room, and just look at all that storage! Very valuable! To find an architect that can renovate on this level is a wonderful find. 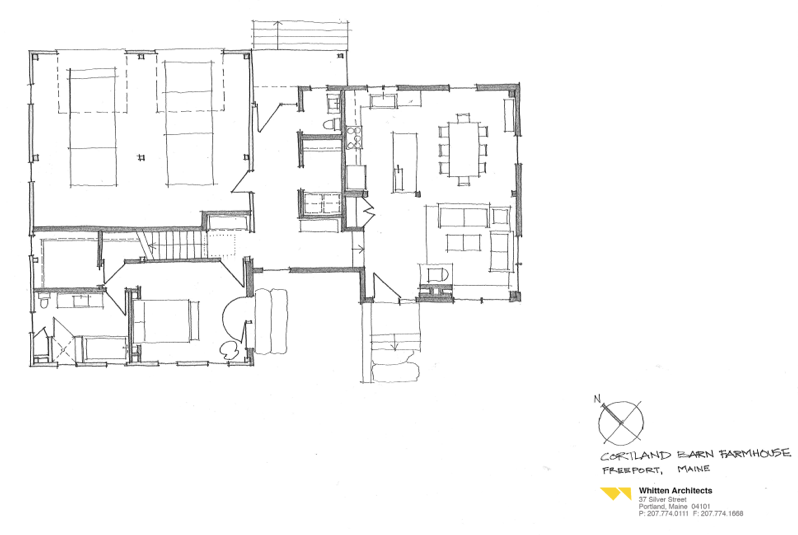 If you are looking to renovate, I wouldn’t hesitate to contact Whitten Architects! Thank you to Whitten Architects and Jessie Carroll for providing so much information!